A kiss is the most affectionate expression of love. Thus to convey this affectionate feeling of love to your beloved, just think no more in choosing this Kissing teddy couple of white in color, resting on a red color cushion boat. 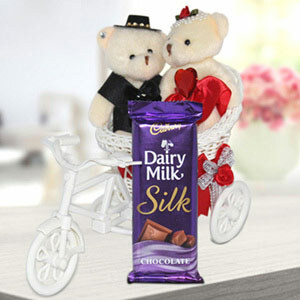 In addition to this, the cute kissing teddy couple comes with a 200gm of Ferrero Rocher Chocolate box and 1 artificial Rose making it an ideal and complete gift combo. The teddies on the boast are the main highlight of this entire hamper. Nice work giftalove!